It has been such a long time since I have posted on here! But, my thesis is now complete and I actually have some time to cook and write. As a side note, I’ve been writing about some of the results of my research over at the Cook and the Curator blog. The first installment, about recreating the 19th century bread is up now, and the soup/meat recipes will be coming soon. The recipe I made this week is also tangentially related to my studies. One of my lecturers heard about the blog and lent me a book that she had picked up in Poland. It’s a copy of Compendium Ferculorum by the chef Stanislav Czerniecki and originally published in 1682. In some ways the recipes are reminiscent of European medieval cuisines, with an emphasis on spices and sweet/savoury combinations. 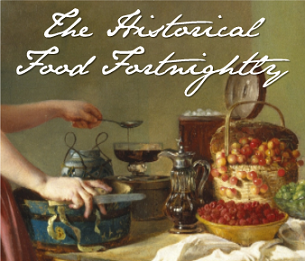 Pottages, sippets, blancmange and meat jellies feature heavily. There is also evidence for a complex network of international recipe exchange; the book includes dishes from Spain, France, England, Italy, Austria and Russia. “Apple Cake for Lent: Prepare your dough as described above, cut peeled apples in three, coat them in your dough and fry in hot olive oil or oil. Being fried, serve forth sprinkled with sugar. It’s not entirely clear which recipe for dough is being referred to here, but the previous recipe for Fig Cake says “Having kneaded the flour with water and yeast in a likewise fashion”, and the Raisin Cakes for Lent before that says “Mix wheat flour with water and yeast and when it looks well risen, add saffron …”. Now, when recreating this there are two ways that I think you could interpret it. Some people online have claimed that modern Polish racuchy or racuszki are related to this recipe. Racuchy are a kind of apple fritter, with slices or chopped apple coated in a wet batter and fried. However, the recipe seems to me to be a bit different (assuming of course that the translation is good). Firstly, the recipe clearly says to knead the dough, which is not something that you would do with a batter. Secondly, the instruction is to cut the apples or pears in three which would make very large fritters. Instead, the recipe to me seems closer to Russian piroshki or pirojki which are a kind of doughnuts made with yeasted dough around a sweet or savoury filling. To that end I adapted a dough recipe from Natasha’s Kitchen, but used only flour, water and yeast as in the recipe. Salt is not mentioned in the recipe, but it really is required to stop your doughnuts tasting very bland. You could also add a pinch of saffron, dissolved in a little of the warm water, which would add a nice flavour and colour. Czerniecki, Compendium Ferculorum or Collection of Dishes. Make the dough by mixing half a cup of warm water with the yeast and leave for 15 minutes until frothy. In a large bowl, place the flour and salt. Make a well in the middle and add the yeast mixture. Add the remaining water and mix together. You may need to add a little extra water to make the dough come together. Once the dough has come together, knead for 5-10 minutes until smooth and pliable. Place in a greased bowl, cover with a clean tea towel and allow to rise for 25 minutes. Knock down the dough, form it into a nice ball and return to the bowl. Cover with a tea towel and allow to rise for another 30 minutes. Place about 1/2 an inch of oil in a frying pan and heat over a medium temperature. Peel the pears then cut each vertically into thirds and remove the cores. Take a small handful of dough and make it into a ball. Stretch and flatten the ball evenly until it is a bit larger than the palm of your hand. Place a third of a pear in the middle and ease the dough around it. Pinch the dough together to seal the pear inside, then flatten the seam. Repeat until all the dough is used. Carefully drop a little piece of dough into the oil. If the oil sizzles and bubbles around it then it is hot enough. Use a slotted spoon to carefully place the cakes in the hot oil in batches. The oil should come about halfway up the sides of the cakes. After about a minute, turn the cakes over (this prevents them from rising unevenly on one side) and allow to cook until golden. Then turn them over again and cook until the other side is golden. Remove the cakes using a slotted spoon and drain on kitchen towel. Serve hot, sprinkled with sugar. Time to complete? : 1.5 hrs. How successful was it? : Tasty, and I was really glad that the dough was cooked all the way through. The pear was lovely and sweet without any added sugar, but the dough needed some salt. They would be particularly nice with a little spice in the dough, and if I was doing it again I would add the saffron. How accurate? : I still think that this thicker, bread-like dough is the way to go, rather than a batter. The original recipe doesn’t include any salt and I did make it that way but it really needs it. Presumably it’s just assumed that you will add it. The other big question that I had was what type of oil to use. Normally I wouldn’t use olive oil for frying, but I gave it a go since that’s what the recipe said (again, assuming that the translation is accurate). The flavour of the oil wasn’t a problem on the day that they were made, but two days later there was a definite gasoline flavour coming through. Since they really should be eaten straight away it’s less of an issue, but it might be worth using a flavourless oil, particularly if you are planning on keeping them for a bit. Czerniecki, Stanislaw. Compendium Ferculorum or Collection of Dishes. Edited by Jaroslaw Dumanowski. Translated by Angieszka Czuchra and Maciej Czuchra. Monumenta Poloniae Culinaria. Warszawa: Wilanow Palace Museum, 2010. This entry was posted in Uncategorized and tagged 17th Century, Bread, Cake, Dessert, Fried, Pear, Poland, Polish, Snack. Bookmark the permalink. Whilst this recipe doesn’t have me rushing to the kitchen, I must commend your blog. Your descriptions and honest appraisals make me view food of this era in a whole new light. My compliments to the photographer as well. Well done!